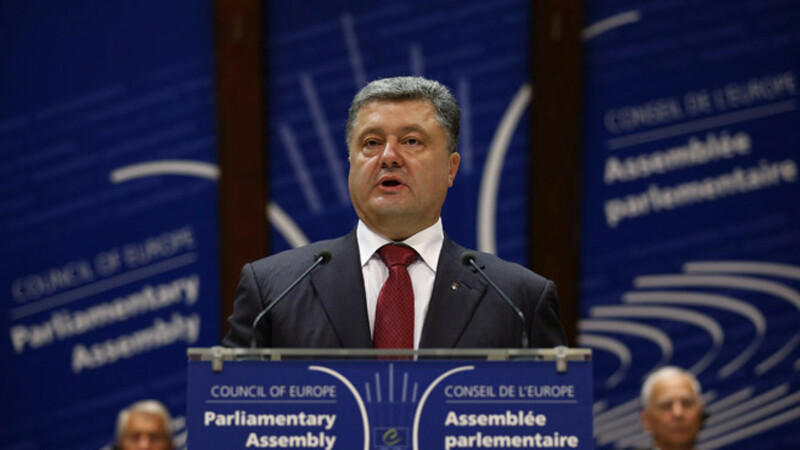 Ukraine's President Petro Poroshenko addresses the Parliamentary Assembly of the Council of Europe in Strasbourg. With Ukraine, Georgia and Moldova set to sign the economic sections of association agreements with the European Union on Friday, analysts say the deals will have minimal impact on the Russian economy but will further broaden the political schism between Russia and its neighbors. Russia should not lose more than 1 billion euros in the next few years as a result of Ukraine's signing of the EU deal, according to one Russian economist. The agreements' greater impact on Russia, analysts said, is their erosion of Russia's informal influence in former Soviet republics. "Current and former CIS countries have a clear choice: Either they join the Eurasian Economic Union with Russia, or associate themselves with the European Union," said Alexei Makarkin, deputy director of the Center of Political Technologies think tank in Moscow. "Russia will react negatively to these signings not because of their economic nature, but because it views this as European expansionism into its traditional sphere of influence," he said. Russia has repeatedly expressed its disapproval of the agreements, claiming that European goods could flood onto the Russian market via Ukraine, Moldova and Georgia, hurting domestic producers. Russia is currently participating in bilateral consultations with the EU about the effects of Ukraine's deal on the Russian economy. A statement released on the website of the European Commission earlier this month said that the Commission's president, Jose Manuel Barroso, had offered President Vladimir Putin the chance to continue political consultations about the effects of Ukraine's association agreement with the EU "as a way to dispel any concerns." First Deputy Prime Minister Igor Shuvalov told reporters this week that the government would take measures to protect the domestic market if Kiev signs the Association Agreement, even without the consent of Belarus and Kazakhstan, Russia's partners in the newly created Eurasian Economic Union. Ukraine, Georgia and Moldova have all taken steps in recent years to distance themselves from Russia, both politically and economically. But the countries' inexorable historical and cultural ties to Russia often leave them oscillating between their European aspirations and Moscow's sphere of influence. All three former Soviet republics signing the EU Association Agreement on Friday were part of the Commonwealth of Independent States, or CIS, in 1991: Georgia and Moldova became full members of the organization while Ukraine opted to remain an associate member. The three former Soviet republics have also had to watch Moscow support separatist enclaves on their territory. Separatist movements in Moldova's Transdnestr republic, Ukraine's southeast and Georgia's breakaway regions of Abkhazia and South Ossetia have received Russia's blessing and support. In 2009, Ukraine, Georgia, Moldova and three other former Soviet republics joined the European Union's Eastern Partnership. The initiative has provided them with an institutionalized forum in which to engage in dialogue with the EU over trade issues and political association while steering clear of the contentious issue of accession to the union. The signing of the economic sections of EU association agreements is now viewed as another step to further widening the political schism between Russia and its former fellow Soviet republics. Although analysts conceded that the influx of European goods might be a legitimate concern, they said that Moscow's indignation at the EU Association Agreements conceals apprehension about European influence in its backyard. "The economic sections of the EU Association Agreements are first and foremost political," said Dmitry Bolkunets, an economist at Moscow's Higher School of Economics. "This agreement is about the European projects of former Soviet republics, of which Russia does not approve. This is about the ability of Ukraine and other former Soviet republics to engage in independent policy-making. Economics is a secondary concern here." The signing of the EU Association Agreements by Georgia and Moldova — countries that each account for less than 0.25 percent of Russia's imports and exports — will have no impact on the Russian economy, according to observers. "Georgia's economy is something like 140 times smaller than Russia's," said Andrei Suzdaltsev, a deputy dean at the faculty of world economy and international affairs at the Higher School of Economics in Moscow. "From an economic point of view, the signing of an EU association agreement with Georgia and Moldova is not problematic for Russia. The bigger bone of contention here is Ukraine, which is acting like a woman who wants to marry two men [Russia and the EU]," he said. Ukraine's 11th-hour decision last November to postpone signing the EU association agreement served as a catalyst for regime change in the country, sparking massive street protests in Kiev and culminating in the ousting of President Viktor Yanukovych. The popular reaction to Yanukovych's reluctance to sign the deal — a decision Russian authorities hailed as a wise economic choice — demonstrated the existence of broader political issues at the heart of the agreement. Kiev is one of Moscow's key trading partners. In 2012, 5.2 percent of Russian exports went to Ukraine, making it the fourth biggest market for Russian exports, according to the European Commission's Directorate-General for Trade. Ukrainian goods — consisting mostly of machinery, equipment and metal products — accounted for 5.7 percent of all imports to Russia. For Ukraine, those percentages are significantly higher: The same year, 32.4 percent of Ukraine's total imports came from the Russian market and Russia was the destination of 25.6 percent of the country's exports. Despite the volume of bilateral trade between Russia and Ukraine, economists believe that even Ukraine's EU agreement will have a marginal effect on the Russian economy. "Ukraine's eventual adoption of European standards might prevent certain Russian products from entering the Ukrainian market, including agricultural and other food products," said Alexander Knobel, director of the International Trade Research Center at the Russian Presidential Academy of National Economy and Public Administration. "But products from these sectors only represent a fraction of what Russia exports to Ukraine. Overall this agreement generates minimal losses for Russia," he said. According to Knobel, the long-term effects of the EU association agreements will depend on how Russia chooses to impose trade barriers on the former Soviet republics and whether its Customs Union partners are able to influence its decisions. Eurasian Economic Union members Belarus and Kazakhstan, whose traditional support for Russia has been rattled by the conflict in Ukraine, have the potential — at least in theory — to prevent Russia from imposing harsh trade barriers on Ukraine, Georgia and Moldova. "Russia would be undermining its own Customs Union if it protects its market from Ukrainian goods without the consent of Kazakhstan and Belarus, as [deputy Prime Minister Igor] Shuvalov said Russia would do," Knobel said. "This would undermine the raison d'etre of the Eurasian Economic Union. Belarus has already spoken against imposing trade barriers on Ukraine. Russia will have to listen to its partners."